The Nintendo 64 port of Command & Conquer lacks the characteristic full-motion video sequences of the PC original, and uses midi music with samples instead of full digital music, but makes up for it with an isometric 3D view and some version-exclusive missions. 2.2.7 Civilian Building "Oil Tanker"
2.2.8 Civilian Building "The Studio"
Enter the Replay Mission screen, then press L.
In addition to the normal campaign missions, the Nod missions list also contains five of the test missions included in the ROM. See Test Maps further below for the full listing of test maps. The listed missions are DYNAMIC, SCG73EA, SCG74EA, STATIC and SCB70EA. In the full list below, DYNAMIC corresponds to SCT15EA, and STATIC is SCG72EA. Finishing the test mission DYNAMIC will give you the GDI ending sequence and the game credits, as if you finished the campaign. All the other missions have no win or lose conditions set, and will never end unless you just stop playing. The SCB70EA one will have the ion cannon attacking the player even after the Advanced Communications Center is destroyed. This behaviour isn't possible in the PC version, since on PC, the Advanced Communications Center is actually the building performing the ion cannon attack. Press L+R at any time during a mission. The debug display contains the X and Y coordinates of both the cursor and the map, plus the ID number of the currently highlighted tile. To instantly win the current mission, press L+R+Up. To instantly lose the current mission, press L+R+Down. Besides the 3D terrain, the midi-based music and the lack of cutscenes, there are several smaller changes between the original PC version and the Nintendo 64 port of the game. 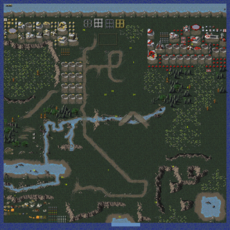 The lack of multiplayer and the space constraints resulted in the removal (or, partial removal) of several units, and even an entire terrain environment was cut. Several missions were also changed for various reasons, and unlike the Playstation and Sega Saturn versions, the Nintendo 64 port does not use the same map format as the PC version. This mission was changed from Winter to Temperate, since the Nintendo 64 version does not contain the Winter theater. This change is purely aesthetic and has no impact on the mission. At the start of the PC version of this mission a mission script sends in a chinook helicopter which is immediately shot down, to show the player the danger of the SAM sites. This script was removed on the Nintendo 64 version. In the A variant of this mission, the ownership of a set of civilian buildings was changed from Special to Neutral, since House Special doesn't exist on the Nintendo 64 version (see Removed Items). There are some slight mostly-aesthetic changes in the A and B variants of the maps. This mission, where the player has no base and controls a strike team, was made somewhat easier by removing an enemy Medium Tank, and by adding a serious set of reinforcements that is sent from the moment the player loses one of their vehicles. The player starts with one less buggy, though. In addition to these changes, certain enemy reinforcements are on foot instead of getting carried in by an APC. The mission script has its "CarryOverMoney" option changed to 0. This option controls the amount of money that can be transferred from the previous mission to the current one. There are two possible explanations for this change. One is that it is done to eliminate the difference between playing the base-building A or B variants or the non-base C variant of mission 7. Though, technically it is possible to take over the enemy base in the C variant and get money that way, too. A more likely explanation, however, is that you are supposed to be low on funds at the start of mission 8, forcing you to sell your Construction Yard in order to get enough funds to capture an enemy outpost; keeping your own technology drastically changes the mission's dynamic. 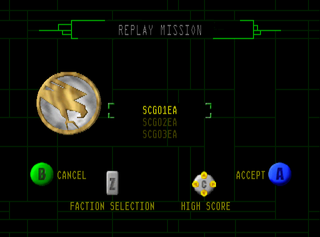 The original PC version of this mission has the player in control of two strike teams on opposite sides of a river. The north team is supposed to secure a besieged base, while the south team has to collect money and eradicate enemy forces on the otherwise-unreachable south side of the river, and can give artillery support across the river. Because the Nintendo 64 version's controls have no quick way to switch between these two forces, the mission was changed drastically, removing the north team altogether, and adding several crossings over the river to allow the south team to secure the base after taking care of affairs on the south bank. The B-variety of this mission is unchanged, most likely because it has a way to reactivate the base in the north that requires a lot less micromanagement. The A and B varieties of these missions are changed in similar ways as the 11A one, removing a river obstacle by making crossings over it, and instead adding enemy defences at the crossing points. The C&C64 intro animation contains some insight into the porting process of PC C&C to the Nintendo 64. Specifically, hints were given to which features were removed. Some of these hints, however, appear to be wrong, and reveal interesting leftovers. "Transfer: Steggie Database - Init: House JP... ...Failed"
This refers to the House "Special" ("House" meaning faction / player side; the term is a leftover from Dune II), which, in the PC version's strings file, is identified as "Containment Team". It was originally created as player house for the hidden dinosaur missions in the PC version of C&C, but was actually used as the house controlling the dinosaur enemies instead. Tests reveal the house was removed. Notably, the ini script of Nod Special Ops mission #2 has multiple buildings on the map owned by house Special. None of these show up when playing the mission on the Nintendo version. Further test also revealed that all of the dinosaur units, namely the Triceratops (TRIC), Tyrannosaurus Rex (TREX), Velociraptor (RAPT), and Stegosaurus (STEG), were similarly removed. "-SSM Launcher... ...SSM Launcher Deleted"
The SSM Launcher (internal ini code: MLRS) is a Nod unit that is unused in the campaign missions of Command & Conquer, but which is usable in multiplayer, and which also often appears in the missions of the game's expansion pack, The Covert Operations. Tests revealed it to be removed in the Nintendo 64 version, despite the fact the ini script of GDI Special Ops #2 has it scripted into the Nod attacks. It seems that the people who made these missions were not aware of the things that were cut from the Nintendo version. "Transmitting: E5 BioWarfare Soldier  Send Retracted"
Like the SSM Launcher, the Chem-Warrior (internal ini code: E5) is a unit only appearing in multiplayer and special missions. It seems the unit actually exists in the game, though. Like its PC counterpart, it is immune to tiberium poisoning, meaning the unit's special coding is present in the game. Its graphics and weapon, however, are not; it has the graphics of the Minigunner, and is missing its chemical spray weapon. "Apache Revision History ...Multiuser API not found ...Apache Deleted"
According to the intro text, the Apache helicopter was removed for being part of the multiplayer gameplay, but this ignores the fact the unit is also accessible to Nod in singleplayer by capturing a GDI construction yard and building a helicopter pad. The unit is actually ingame and working perfectly, and is even featured in the GDI Special Ops mission #1. The mobile headquarters (internal ini code: MHQ) is a special unit used in C&C for Capture-The-Flag multiplayer games without bases enabled. The lack of base gives the players no "home" position to return captured flags to, so instead of flags to capture/protect, the players are given a unique unit that is presented as the mobile command center from which the commander is controlling the battlefield. The objective in these games is to destroy these mobile headquarters for all opposing players, which eliminates them by blowing up everything owned by that player, as if triggering the multiplayer game "Resign" function. 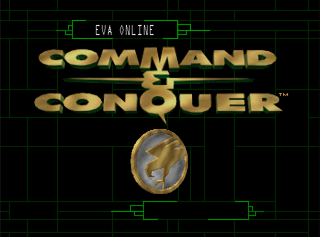 Mission tests revealed that, surprisingly, the unit exists in the Nintendo 64 version, and while it uses the graphics of the APC, it does trigger the player elimination when it is destroyed. The visceroid is a tiberium-mutated blob of tissue that spawns randomly in multiplayer games to harass players on the PC version. Mission tests revealed it does not exist on the Nintendo 64 version. This building, which represents an oil tanker truck being loaded or unloaded at a pumping station, is present in the ini scripts of Nod missions 7(B) and 10(A), and in Nod Special Ops #2, but does not appear ingame. Further tests confirmed it is missing from the game completely. This is very odd, considering that it is really just a civilian building, in all aspects except for the special internal name; normal civilian buildings all use codes of the type "V##", whereas the Oil Tanker has code "ARCO". This building was tested because it is unused in PC C&C; it is an Easter egg representing the building in which Westwood Studios was located when they made the game; 5333 South Arville Street #104 in Las Vegas. Tests revealed it to be ingame, but too small. The structure's model looks like the original graphics in the PC version. Just like in the PC version, the building's foundation size is 4x2, with the left 2 cells passable. 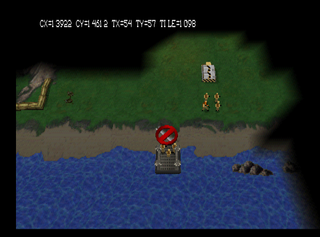 However, the N64 ingame model is displayed at the size of a 2x2 building centered on its original 4x2 foundation. Unlike the Oil Tanker, this building follows the normal internal naming system for civilian buildings; its code is "V37". Some maps on the N64 version have small changes in their terrain that don't seem to serve any purpose, like slight modifications in roads. Further investigation revealed that these edits were made specifically to reduce the amount of needed terrain graphics; experimentation with map values showed that any tiles not used in any of the included maps simply don't exist in the ROM at all. Many of the missing road crossings and forks were faked by connecting similar road tiles in a way that wasn't noticeably different. This is the list of tiles that exist on the PC version but not on the N64. Note that tiles only found on the Winter theater are not included, since that whole theater does not exist in the N64 version. -Sending terrain plans               ...Send overwritten"
Command & Conquer missions are pairs of files; a binary file containing the mission's raw indestructible terrain, and an ini file containing all objects placed on that terrain, as well as all mission scripting. The ini file format of the Nintendo 64 version is completely unchanged compared to the PC version. The terrain maps, however, are incompatible. For both versions, a terrain map is a byte array of 8192 bytes, which can be deconstructed to 64x64 byte pairs, meaning, two bytes to determine the terrain piece to use on each of the map's 64x64 cells. On PC (.BIN extension), the first of these two bytes is the internal ID of the tileset file to refer to, and the second byte is the cell index inside that tileset file. The Nintendo 64 version (.MAP extension), instead, treats them as a single list of all available cell graphics, meaning the two bytes are simply a 16-bit cell graphics ID. This format change means that unlike in the PC version, maps cannot easily be exchanged between theaters; the different theaters on PC have many common tilesets (most notably cliffs and roads) which can simply take the equivalent graphics of the different theater, but on the Nintendo version the IDs of all tiles are radically different between the Temperate and Desert theater. A tool has been created by Nyerguds to convert maps between the Nintendo 64 and PC format. It utilises a mapping of corresponding values, built up by comparing the files of Nintendo 64 maps and PC maps for which the terrain is identical in both versions. C&C64 missions contain an additional .IMG file that serves as height map, to convert the originally-flat terrain to 3D. The file is of a format used by many normal graphics in the ROM (a viewer/converter for it is available here), and is basically a simple 8-bit image without included colour palette. The values on the image serve as height values for the map rather than as referenced palette indices. The values in the image indicate the height of the corners of the map tiles, which means that for a standard 64x64 cells C&C map you get a 65x65 height map image. The height map system shown on GDI mission 11: the map, the height map image, and the two overlayed on each other to show elevated areas. The ROM contains a number of 65x65 images with the same name format as the missions, but starting with "CM" instead of "SC", which look like they're somehow derived from mission layouts. However, they don't look like height maps, and since they are high-colour images and not indexed ones, they don't seem usable as height maps, either. The CMB10EA.IMG file (right), shown next to the mission itself (left) and its height map (middle). There is a voice clip in the Nintendo '64 version that doesn't appear in any other port of the game. It is an extra 'idle' sound for Dr. Moebius, in which he says "A most remarkable Metasequoia glyptostroboides!" The sound clip was most likely not used originally because the sequoia is a genus of trees from North-America, and all missions in the game take place in either Europe or Africa. The game contains a large amount of normally unplayable missions, some of which are not even listed through the debug function's hidden missions list. Surprisingly, these include practically all of the bonus missions from both the Playstation port of the game and the Covert Operations expansion pack of the PC version. As noted before, though, the "Special" house and SSM launcher are missing in this version, and the Chem Warrior is defunct, breaking many of the missions that rely on these things. Here is the list of all special maps. The SCG## and SCB## missions with numbers below 20 are not listed here; they are the game's normal campaign missions. The four normally-playable Nintendo version bonus missions are included in the list for completeness' sake, and indicated with bold text. They are the only ones in the list which contain a height map .IMG file to give the mission 3D terrain. SCG32EA - Test mission showing all units and structures, on a rather low effort terrain map. The mission script includes all items available on the PC version, except for the dinosaurs. SCG36EA - PC Covert Operations: Infiltrated! SCG71EB - Same as SCT15EA (see below), but with no terrain on the map. SCG72EA - Playstation GDI Special Ops #4 (the special hidden 'PATSUX' mission), but with all mission content on the terrain map replaced by a variation of the test setup in SCT20EA (see below). The terrain does not suit the test content at all; many things are placed on water. SCG73EA - Same as SCG32EA. SCG74EA - Same as SCT50EA (see below). SCB31EA - PC Covert Operations: The Tiberium Strain. This mission revolves entirely around the Chem Warriors, which are defunct in this version. SCB64EA - Alternate version of Nintendo 64 Nod Special Ops #2, with the House Special buildings enabled by changing them to GDI. Missing .MAP terrain file. SCB70EA - Same as SCT12EA (see below), but with its tech level set to maximum. SCT12EA - Nod test mission based on Nod mission 12, with a full prebuilt base on both sides, and some unit line-ups. SCT15EB - Same as SCT15EA, with some minor changes in tiberium density. SCT20EA - A blank terrain map with a test setup of several units and buildings. SCT21EA - Variation on SCT20EA, with small changes in positioning. SCT22EA - Another variation on SCT20EA, with small changes in positioning. SCT23EA - Another variation on SCT20EA, with small changes in positioning. SCT50EA - Superweapon test mission. Has no terrain on the map, but contains lots of GDI and Nod minigunners. SCT51EA - A blank terrain map with lots of GDI minigunners. SCT52EA - A blank terrain map with lots of Nod minigunners, but shown completely black when played because the player is set to GDI. This page was last modified on 22 January 2019, at 07:57.